The workbook for Talking about Jesus - a simple course to help Christians share their faith. Think of the people you meet everyday: your family, your work mates, the man at the newsagency, the old friend you catch up with after work. Is there a single one of them who doesn't need to be following Jesus? All the same, many Christians feel uneasy about reaching out to those around us. We're unsure where to start and what to say, and more than a little afraid that we'll make fools of ourselves. - how to explain the gospel of Jesus in a simple way. 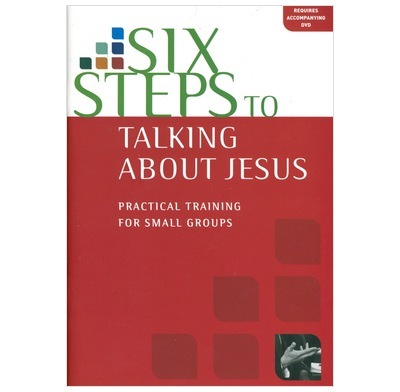 Six Steps to Talking about Jesus is a course best undertaken in a small group (3-8 people). - a workbook for each person, which also contains notes for group leaders. Why not have a look at our Starter Pack? I have found that this book and associated dvd a real asset for those Christians who would love to talk about our saviour Jesus Christ with those people who live in our Parish, whether they go to the church or not! DVD presentation-a sleep inducing monologue. Disappointed. Our Church recently used the DVD and workbooks over the recommended period of 6 weeks. The material is Biblical, of a high standard and easy to use. At the end of the workbook there is a handy guide for each chapter which outlines how to work through each session and suggestions for the ammount of time to take for each item. Simon Manchester is an excellent presenter on the DVD and we found that the positive approach of the course towards personal evangelism has encouraged our members to share their faith with others. To encourage discussion, we divided into groups of about 6 each evening, provided bottomless tea, coffee and biscuits and had some very special times of fellowship. (We had such a good time, we just couldn't keep to the recommended 1 hour per session - try as we might!). One suggestion for those leading a course with this material, you may want to research and give alternates to the Gosple outline, the 4 R's, of session 2 (Rebellion, Rescue, Resurrection, Response). Some of our people found the ABCD that Simon mentions to be easier to remember and use (Admit, Believe, Consider, Decide). We printed out copies of that one and a few others (i.e. Grace, Man, God, Christ, Faith from Evangelism Explosion), which have been useful as well. We also spent some extra time on wiriting out and practicing our testimonies. For an introduction into personal evangelism, and encouraging Christians to be outwardly focussed this workbook and DVD course is highly recommended. I've just run the course for my second time, but at a different church. It was weekly for six evenings for an hour and a half. We thank God that everyone seemed to take steps forward in being equipped for evangelism. It was especially encouraging that some were persuaded that evangelism doesn't have to be awkward or insensitive and there are different ways we can all be involved in being Christ's witnesses. In my experience, it is best to try to run the course as it is designed, rather than reduce the number of weeks or try to get away without workbooks for everyone. We use this for our small groups in Wellington Presbyterian. We have found the study challenging and the questions at the end of each section about telling "your story" are doing what they are designed for, hearing each others story and giving confidence to tell it, some for the first time. We had some reservations about this at the start but all our groups have tackled it in different ways. One piece of advice is to ignore the timings at the back as each study really takes much longer a minimum of three hours. We decided on this study because we have a mission planned and "Talking about Jesus" is central to the mission. We are praying that after going through the book we as christians and as a church will be better equipped and more confident in ourselves, the gospel message and the God who saves! Only one criticism, the video could be better, but we have just finished Discipleship Explored where the Video is brilliant. Otherwise study excellent! I have used this course for two small groups over the past twelve months and found it extremely helpful and challenging. The six step process is useful, although it may seem a little painstaking to go over 'old ground' in the first three sessions. The first three sessions remind us of some basic Christian fundamentals - WHY we tell people about Jesus (love), WHAT we tell people (understanding the gospel), and WHO saves (God saves, giving us the privilege of praying for those we care about). The second three sessions are more practical - the rubber really hits the road! - and it is through these sessions that we get many helpful hints on how to talk about Jesus in the most natural way, without causing any offence, yet drawing people into hearing the Good News. Throughout the six weeks, each person is able to practice telling their own story, firstly within the group itself, then they are encouraged to tell someone outside the group as 'homework'. All of this is designed to build confidence in telling our own story, and in telling the gospel truth, which everyone needs to hear. Other reviewers have commented on Simon Manchester, the main speaker on the DVD. He is quite 'dead pan' in his manner of speaking, but what he says is really important, and most times there is so much great stuff in his talks that it is impossible to digest at first viewing. Be aware that you may not appreciate his style of presentation, but ignore that to focus on what he is saying. This series has been produced by Australians, so the accents are Australian. This was no problem for me, as I am an Aussie ex-pat - but that's not why I give this series a great review! I think this is a marvellous series and I highly recommend it to any small group who is really keen to develop skills in talking about Jesus. We used this material adapting it to our own situation. Some liked the straightforward delivery from Simon Manchester ( 'no gimmicks') Others thought it a bit pedestrian. But everyone took something from it. One comment was 'I didn't realise how helpful it was until I found myself in situations where I was able to witness.' People generally appreciated the practical exercises that made them think about their own concrete situations. The video/study/exercise combination provided a good mix. This series has been very well planned and thought through by the authors - there are no wasted words and the presentation of the Gospel is clear as is the call to go out and tell others. We ran this series over 6/7 fortnightly meetings and most of our people were favourably impressed. Some found the delivery rather monotonal but I felt that this enabled us to concentrate on the words rather than the speaker. I would certainly recommend it to others. We're squeezing each session into an hour of a longer evening as part of a training course with a keen, sharp bunch, and it's going down well. The leaders' notes are right in saying that you can do it in an hour but that there would be benefit in taking longer - particularly to pray. Presentation is unimaginitive until you get to some good role-plays in the final session, but content is helpful throughout. Someone falsely accused Simon Manchester of never blinking.